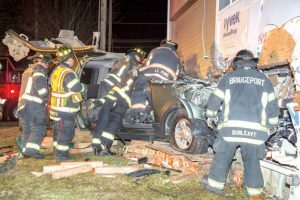 On February 19, 2017, the Bridgeport (CT) Fire Department was dispatched to an MVA on upper Main Street. First units found an SUV off the road and into a commercial structure. An extended extrication was started to remove the trapped driver all while needing to stabilize both the vehicle and the compromised structure. The driver was reported to be in stable condition at the time of removal.